← Jar: Half-Empty or Half Full? I’ve always found phyllo dough to be challenging to work with. Those paper-thin sheets are just dying to tear as you delicately peel them off the pile. So, when I saw that this week’s recipe for French Fridays with Dorie for Crispy-Crackly Apple-Almond Tart was built on a crust made of layered phyllo dough, I felt a touch of dread. Deep down, I think the trick with phyllo dough is “practice makes perfect”. It’s all about comfort and confidence. So, I forged ahead. For this elegant tart, the base is built by oh-so-carefully transferring a sheet of phyllo to the baking sheet, brushing it with melted butter (still carefully), sprinkling with sugar (I used turbinado sugar and sprinkled with abandon, using way more than called for), and repeating. A few of the early sheets had tears that could be hidden, and I had to discard a sheet or two, but that’s why it comes twenty sheets in the pack, I guess. Next comes the almond cream, also known as frangipane. Almond flour, egg, sugar, vanilla, and cream are whisked together to form a thick paste. This is spread, most carefully over the crust. I tried to leave a little border, but it obviously wasn’t enough of one, because the almond cream oozed over the edges while I was working on the fruit. It still tasted good, but didn’t help with aesthetics. Finally, the tart is topped with fruit. At the market, a basket of figs called my name, so mine was intended to be a crispy-crackly fig-almond tart. I couldn’t decide whether to place the figs cut side up or down. I’m not sure I love the look of my choice. Unfortunately, the figs didn’t quite cover the top surface, so I added two rows of sliced apples to fill the space. Because I didn’t anticipate this, my fruit arrangement was not symmetrical so looked far from “bakery-ready”. The apple slices were challenging, trying to keep them fanned together while transferring them to the tart. I felt like I was playing some kind of motor-skill game that I wasn’t winning. Had I aimed to make a fully-apple tart, there is no way that three apples would have covered the tart. I’m not sure whether Dorie’s apples were huge, or whether she spread her apples less densely. The two crosswise rows of apples on my tart used one and a half apples. I would have needed 4 or 5 to cover the whole thing. I liked the closely packed look, but this was definitely another recipe where a photo would have been very helpful to see the intent. When the tart comes of out of the oven, there’s one final step, to glaze the top with melted apricot jam. This gives the tart a lovely sheen and a touch of additional sweetness. On baking, the almond cream spread some more, so I didn’t get many crackly edges. However, the crust still crisped up underneath, so each bite had plenty of crisp and crackle. The figs tasted good, but I preferred the apple. Sliced leftovers look terrific in the cake dome. Having made this for a weeknight dessert for two, I felt a little like my tart deserved a better audience, like a little black dress with no party to go to, just the kitchen table. I have some work to do on the final appearance. I’m thinking I might like this better fitted into a rectangular tart pan, where the edges will contain the gooey filling without going where it shouldn’t. I do plan to pull out this crispy-crackly tart recipe the next time I’m asked to bring dessert to someone’s house for dinner: the well-deserved party for my elegant (and easy) dessert. If you want to try this one, invite me over! We don’t post the recipes, but you can find it in Dorie Greenspan’s book Around My French Table. To read about the other FFWD bloggers’ tarts, follow their links here. 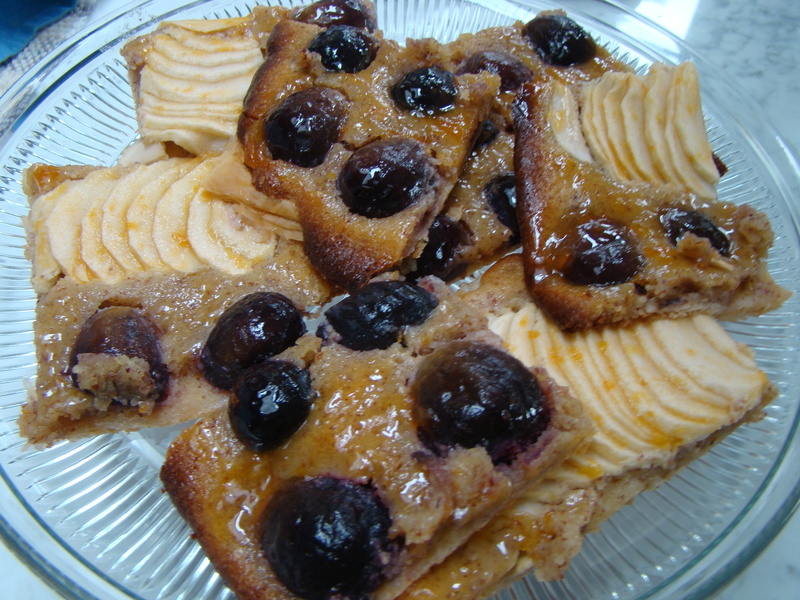 Posted on 12 October 2012, in Baking, French Fridays with Dorie and tagged apples, figs, French Fridays with Dorie, tart. Bookmark the permalink. 20 Comments. You can bring your platter of figs and apples my way any day :-) Figs sound great. I think a lot of fun could be had with this one – its such an easy idea with lots of options. Love that you switched it up with some beautiful figs! Agreed, I will definitely be making this one again. In fact, since I cut the recipe in half the first time, I am already craving another one. Betsy, what a fun idea adding fresh purple figs to your apple tart – figs and nuts go so well together and your tart looks wonderful – perfect for fall, even if you were not totally happy with the way the figs looked like, I love the presentation and would really have enjoyed a taste! The fig idea sounds really, really good! I agree with you, phyllo seems hard but it´s just a matter of practice. Lovely tart Betsy! Yummy figs! I like choices, so I like how you did two tarts in one. I think the tart pan might be a good idea if you want it to look less rustic. Very cool that you used 2 fruits! This was a fun tart to make, but definitely takes patience! Betsy, Figs were such a wonderful idea!! Your tart looks so pretty…and very delicious! Ooooh, the fig ones look lovely – I am looking forward to fig season here again. What a great idea to also use figs. I bet the combination of apples and figs was so tasty. The phyllo dough was difficult to work with, but I loved how it curled up at the edges. Your final arrangement of the tart slices looks so lovely, Betsy. I had the opposite problem :) Croatian phyllo pastry is so thick you cannot tear it if you tried. 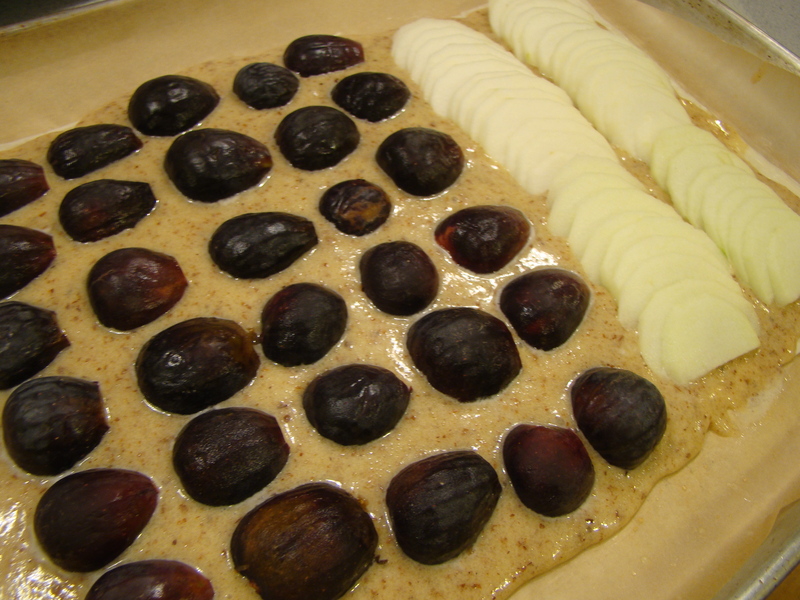 I only used 5 sheets and the tart was coming out very thick and dry…can’t wait to go back to Greece and use the thinner more delicate one…the figs are such a nice variation…next summer I will make it with figs!!! Betsy, you spent your entire Post (which made me laugh, incidentally) apologizing for your fabulous-looking pastryl I would love to have tasted the fig tart part!!! I wish Dorie hadn’t used the term “fan” in your recipe directions because I think that threw everyone, me included, for a loop. 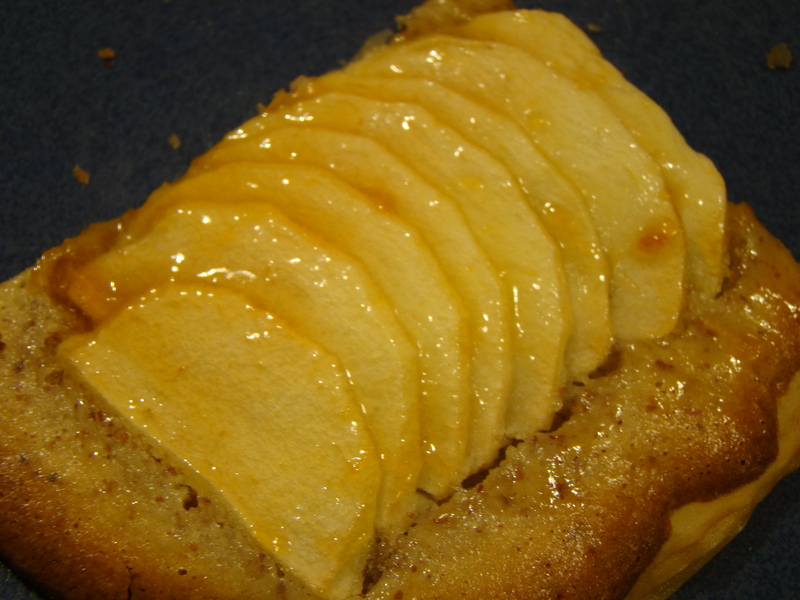 After baking the tart, the apples on everyone’s just seemed to fall into line, so to speak. I think we all did great with this recipe and yours was loverly, my dear. I dread working with phyllo too… I haven’t made this yet and am debating with myself whether to try to phyllo or just use puff pastry (right now I’m leaning towards the phyllo). Yours looks great! Karen, do the phyllo. It was a nice crust. The figs look great. I agree that this would be a great dessert to bring to a party. Yes I went online to see if I could find what it should look like (fortunately Epicurious had a pic) but I was confused too! And those small tears in the filo didn’t matter did they? I LOVED this and will be making it again soon!